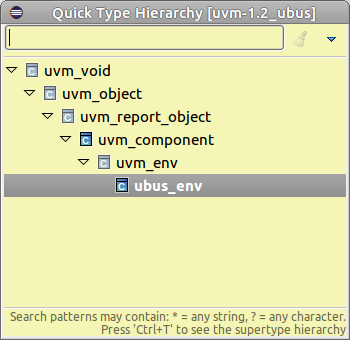 The Type Hierarchy View presents the inheritance and the members of a class or interface class. Place the editor cursor on a class name, right-click and select Show > Type Hierarchy or press F4. Select a class in the inheritance tree to view its members. 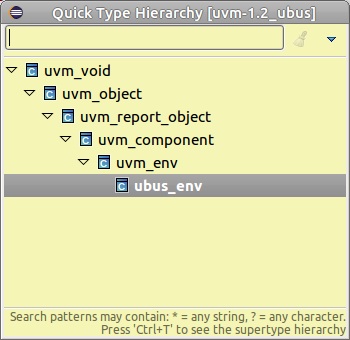 Tip: To further inspect the Type Hierarchy or see Usages of a class, right-click in the inheritance tree. Tip: You can use CamelCase or Simple Regex to find a specific element. Show History List See the previously inspected types. Show Full Type Hierarchy For a class, shows the super-classes and sub-classes. For an interface, shows the sub-classes and sub-interfaces (like Show Subtype Hierarchy). Show Supertype Hierarchy For both classes and interfaces, shows the super-classes and super-interfaces, with the selected class or interface at the root of the tree (the tree is "upside-down"). Show Subtype Hierarchy For a class, shows the sub-classes. 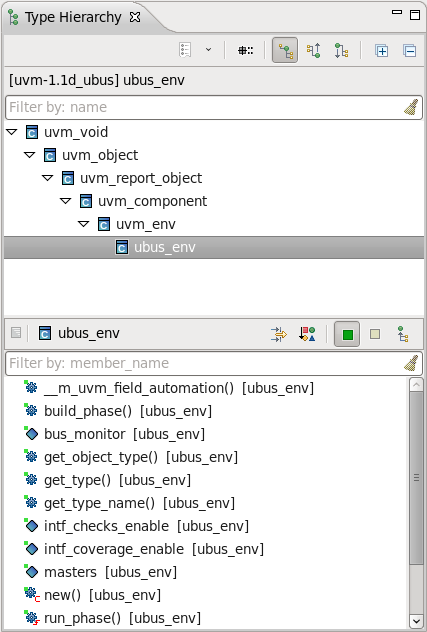 For an interface, shows the sub-classes and sub-interfaces. Sort Members by Category Sort by category, otherwise alphabetically. Show Only Public Members Hide local and protected members. Show All Predefined Members Show predefined members like pre_randomize() even if not explicitly overridden. Show All Inherited Members Show members inherited from super-classes and super-interfaces. You can quickly inspect and jump to a specific parent or child in the hierarchy. Press Ctrl+T with the cursor positioned on the element name. The Quick Type Hierarchy View will pop-up and present a filterable list with all of the selected element's hierarchy. Select and press Enter or click to jump to the corresponding source location. Tip: While the Quick Type Hierarchy View is open you can press Ctrl+T to switch between Full type and Supertype hierarchy. For functions, you can also see the implementations along the hierarchy (icons are not grayed).